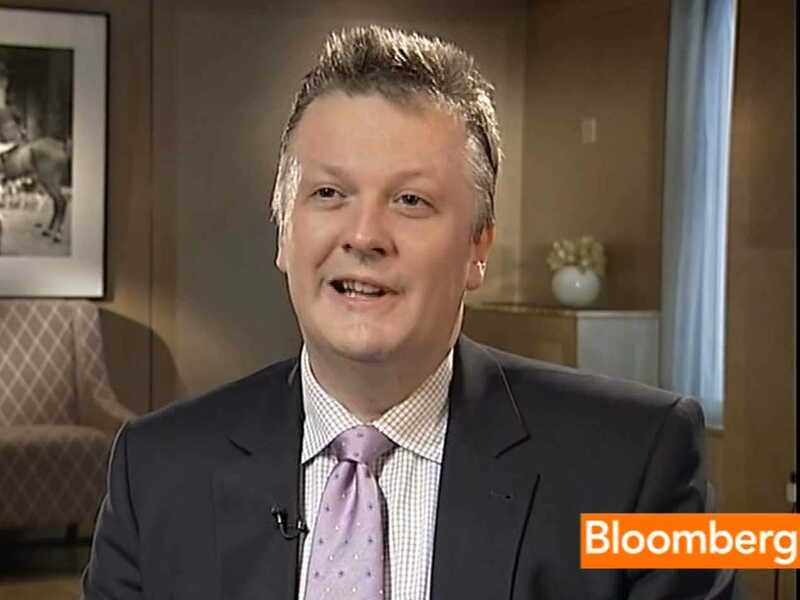 Goldman Sachs Chief European Economist Huw Pill and his team are out with a new report on the fiscal situation in the euro zone, and they are very much focused on debt.Specifically, the report takes aim at some of the eurozone’s biggest economies. While smaller economies like those of Greece, Portugal, and Ireland have submitted to international rescue programs – mostly allaying fears over outsized debt loads – others remain “too big to bail,” so to speak. Goldman’s Europe economists point to one of the central sources of tension in the ongoing euro crisis – the inability of euro-area governments to meet their own budgeting goals. While weak growth is a key near-term risk to debt accumulation, the medium-term risks focus on the ability of governments to maintain large primary budget surpluses and avoid ‘fiscal fatigue’. Simply attaining our base-case scenario of debt dynamics requires that after half a decade of austerity, as growth returns and market pressure eases, no subsequent fiscal easing occurs. But governments have had difficulties in the past preventing public spending from increasing when the ‘good times’ return. That said, while the primary surplus requirement is large, on our projections headline budget figures in Italy, France and notably Spain remain in deficit for most or all of the next 20 years. With public attention focused on the headline figures, ongoing deficits may help contain fiscal spending pressures. Fiscal rules and institutions that ensure that primary surpluses are maintained will thus become increasingly important. Recent and potential budget target misses means that the credibility of European fiscal rules is still in question. Structural balance budget rules have been implemented, but their effectiveness are yet to be tested. And more ambitious targets may be needed to secure sufficiently fast debt reduction. Debt sustainability of Euro area countries hinges on governments’ ability to prevent future surpluses from being eroded by spending pressures. Securing the credibility of European institutions in enforcing medium-term budget surpluses would, in our view, go a long way in reducing current fiscal risk in the Euro area. What does Goldman have in mind? 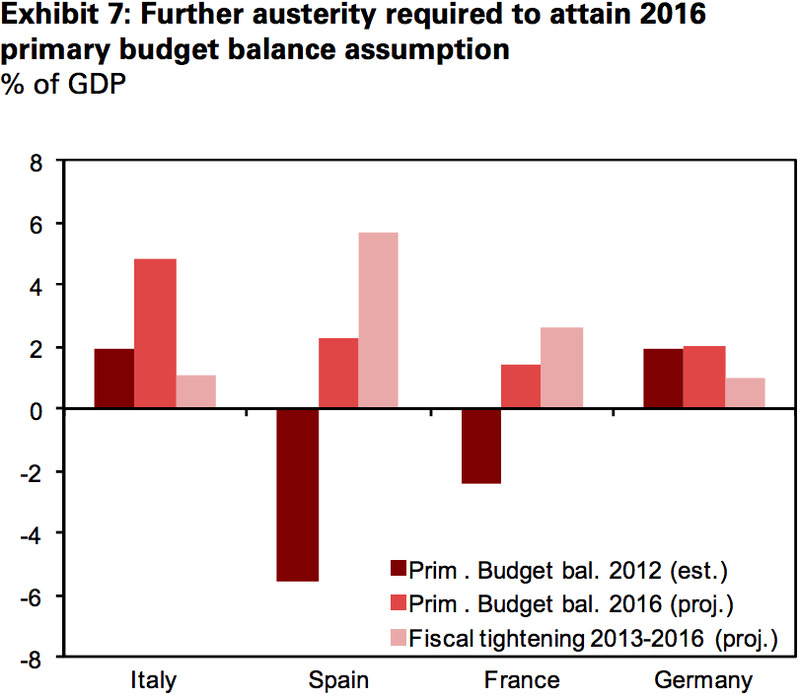 The chart below shows the bank’s projections for how much austerity each of the four largest economies in the euro zone will have to undertake to get to balanced budgets by 2016. Securing sufficiently high primary surpluses via austere budgets that reduce government expenditure and / or raise government revenues. Implementing structural reform and allowing for economic restructuring that raises nominal growth, either via (i) higher real growth following productivity improvements, or via (ii) less deflation following a reduction in the external rebalancing requirement. Regardless of what they choose, Europe’s biggest economies are in a tough spot.